The End Of The European Union? The European Union will collapse within fifteen years. The EU is a political monster created by the elite. Its goal is to exploit the populations of nations which have nothing in common, all in the interest of globalization and big companies. Its bureaucracy, to use an expression of Nietzsche, is the “coldest of all cold monsters” [*1]. It employs 42 500 [*2] outrageously privileged European civil servants who are supported by the taxpayer to produce nothing. Brussels has absorbed the sovereignty of its state members, which triggered secessionist velleity in Scotland, Catalonia, Flanders, … The European Union is not elected and yet it has the authority to impose its will on countries and their citizens. The EU prefers legislating on the size of the cucumbers and bananas [*3] instead of solving the refugee crisis. The euro is an economic absurdity. The EU is an abomination. Thank you for reading this subtle and optimistic summary of the main critiques concerning the European Union. Today, it is not only the “extreme-right” parties who convey this speech. Sentiments of Euroscepticism and populism have spread to the traditional political parties that have been in power for the last decades. But most people who make claims along the lines of those above don’t even know what they are talking about when it comes to the EU. So we might ask: What is meant by the “EU”? Let us examine its history and structure more closely before making our evaluation as to its fate. achievements which first create a de facto solidarity.” (The Schuman Declaration, 9 May 1950). Officially, the “European Union” has existed since the 1st of November 1993 upon the ratification of the Treaty of Maastricht. But an organization for the cooperation of European countries has existed since 1952, when the European Coal and Steel Community was established as an industrial project aimed at regulating these key resources for the hope of peace and prosperity in the aftermath of World War II: What better way to prevent war in the future than the pooling of the war industry? Thereafter, the cooperation between its member states was continued through the Treaty of Rome, which established the ECSC as the European Economic Community and which also established (separately) the European Atomic Energy Community (Euratom) in 1957, which still exists today as a market for nuclear power in Europe. The EU has its own time, which does not always match the time of the news. Through crises and treaties, the EU has evolved in increments. Today, its main political organs include the European Commission, the Council of the European Union, the European Parliament, and the European Council. These organs work together to regulate the EU. The European Commission serves as an executive cabinet that proposes legislation to the EU bicameral legislature; the Council of the European Union (Council of Ministers) and the European Parliament share the responsibility of deciding which legislation to adopt; the European Council, which comprises heads of state or government of the member states, gives impetus to the EU policy. All these institutions, even the European Parliament, work in Brussels. The “European Union” or “Brussels” as a decision-maker is therefore a vague and confusing notion. But most European citizens don’t understand the organization of the EU, which allows politicians (such as David Cameron, Beata Szydło, Manuel Valls, Sebastian Kurz, etc.) to use the “European Union” or “Brussels” as scapegoats for all their national problems. Despite socio-economic and political turmoil, the shape of the EU has not seen much change for over a decade. The last major change within the EU happened in 2007 with the ratification of the Treaty of Lisbon, which was extremely difficult to negotiate. Since the 2008 financial crisis, the EU has been primarily preoccupied with crises, including the 2010 European debt crisis and the so-called “refugee crisis” that erupted in 2015. Brexit and the election of Donald Trump also weakened the internal and the external position of the EU, and paved the way for Euroscepticism among its member countries. In May 2017, the election in France of the truly pro-Europe candidate Emmanuel Macron brought about major change. Benefiting from a strong aura thanks to his victory against Marine Le Pen [*4], the populist candidate par excellence, Emmanuel Macron developed what many regard as a very ambitious European integration plan. How could the European leaders refuse to hear the ideas of a President who defeated Euroscepticism in his own country? During the last ten years, France was considered the “sick man of Europe” because of its political and economic immobilism. Indeed, to ensure the stability of the eurozone, the European countries must respect a limitation of deficit to 3% of GDP [*5]. Since 2009, France has been monitored by the European Commission on account of its refusal to reduce its public deficit. With Nicolas Sarkozy and especially with François Hollande, the two predecessors of Emmanuel Macron, France gave up its European leadership in order to avoid criticism about its economic insufficiency. With the recent success of the first step (employment law) among six in his program to revitalize the French economy and the coming adoption of the 2018 budget plan to reduce the public deficit, Mr. Macron has restored France’s credibility. He relied on this credibility to give an effective speech about Europe at the Université Sorbonne on the 26th of September 2017. A European Defense Fund to bolster the cooperation of the European military research and industry. A European Asylum Office and a European Frontier Police to improve the reception of the refugees and send back those who are not eligible to the right of asylum. Social and fiscal common standards to make national rules converge. The creation of European universities (through association and twinning) to strengthen the exchanges between the young Europeans. 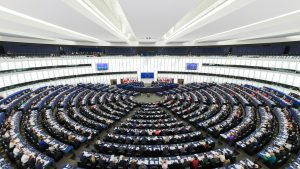 In order to increase the power of the supranational level, he also suggested a European Commission limited to 15 commissioners (instead of one for each of the 28 member states) and transnational lists for the 2019 European Parliament elections. However, the focus will be on the Economic and Monetary Union for the negotiations to come. The institutional reforms he is now defending are a eurozone budget to fund common investments and cope with crises, a European Minister of Finance, and a eurozone Parliament made up of Members from the eurozone countries. The speech’s date was well-chosen in order to be at the center of the current negotiations for a new coalition in Germany between the CDU, the Greens and the FDP (hostile to Macron’s ideas concerning the eurozone). Christian Lindner, leader of the FDP, has already claimed the position of Federal Minister of Finance in order to maintain control over this issue. Of course, making a new treaty to deepen and improve the Union requires the approval of all the members. In the end, each country has a veto right over its ratification. But a French-German impetus is implicitly necessary. Right beside Germany and Angela Merkel, France is back with Macron. With his ideas about a bolstered eurozone within the EU, Mr. Macron has openly supported the taboo concept of a “Multi-speed Europe”. Since the 1957 Treaty of Rome, the EU has been based on the belief that the member countries must always adopt the same European institutional rules: There must be only one integration level for all. The supporters of this approach explain that a split EU would become obsolete. But, with 28 members, the EU cannot be a homogenous construction. It needs to be “multi-speed” to accommodate diversity. Countries like the UK and Denmark have already negotiated opt-outs to keep their national currencies. If some countries within the European Union want to go further in the integration on a special issue, they should be able to do so without the approval of all the other member states. In legal terms, this procedure is called “enhanced cooperation”. It is different from opting out: It requires the cooperation of a minimum of nine member states to be legally viable. For instance, a country like Poland with its current PiS government is not 100% Eurosceptic. Poland supports an enhanced cooperation in the military field. “Multi-speed Europe” could be the breath of fresh air the EU needs. “The founding fathers built Europe in isolation from the people, because they were an enlightened vanguard and perhaps because they could do that, and they made progress by proving subsequently that it worked. Perhaps they enjoyed a trust that is no longer exclusive to leaders; that is how things are. They lived in another time, when means of communication were not the same”, Macron proclaimed [*6]. At school the Europeans are taught the EU is great because it ensures peace on the continent. They read visionary speeches but don’t understand their connection with the present. A new military conflict between France and Germany couldn’t occur again. War seems so far… The EU legitimizes itself with arguments of the past. War needed to be prevented once and for all: that is why the EU was implemented from the top. What about today? The time has come to listen to the Europeans and ask them what their vision for the future of Europe is, Macron says. “European democratic conventions” are not just a new idea of these eurocrats to involve citizens with the illusion of power over the decision-making process. The demands for a better EU comes from its citizens. But it will be challenging to implement such a consultation with the populace on a continent-wide level. To convince the other European governments that this approach is valid, non-populist, and safe, the “deliberative opinion poll” technique [*7], invented by James Fishkin, could be used. Several experts have written opinion columns to put the idea on the agenda. It involves presenting a sample of the society with an issue and impartial arguments for and against a certain mode of action to help them make an informed decision about what position to take in relation to it. No consensus has been reached yet among the European leaders regarding such a continent-wide consultation. “Peace, prosperity and freedom through sovereignty, unity and democracy” closed Emmanuel Macron. In 1849, Victor Hugo called for the creation of the United States of Europe. One day, his dream could become reality: the EU could become a political unit as powerful as China or the United States of America. Even if, because of its history, the EU will never hold the same interventionist hard power as the US, the reasons to promote and defend the EU as a political project in its own right are numerous. From the Kyoto Protocol and the reduction of the greenhouse gas emissions to its contribution to development aid, the EU has achieved a lot to be proud of; the European culture and the EU’s achievements unite Europeans more than they divide them. European leaders, France doesn’t force you to do anything. Mr. Macron has done the worst of the work already. The ball is in your court. Robin Corrèze is a French exchange student for two semesters in Bard College Berlin. In Sciences Po, he attended the French-German campus of Nancy. His European convictions led him to join En Marche — the political party of Emmanuel Macron — the very day of its creation in April 2016.